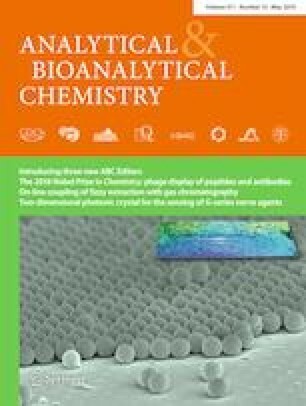 Hyaluronic acid and its acrylate derivatives are important intermediates for various pharmaceutical, biomedical, and cosmetic applications due to their biocompatibility and viscoelasticity properties. However, these polymers are inherently difficult to characterize due to their significant heterogeneity regarding molar mass and chemical composition (degree of substitution, DS). 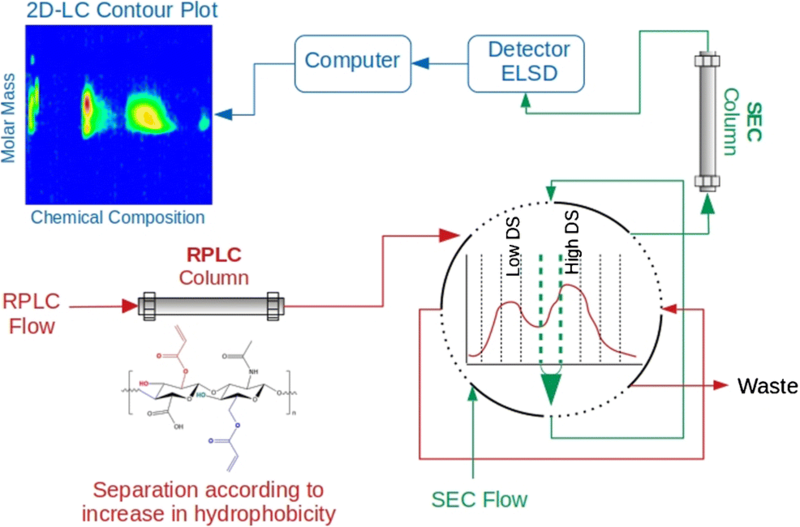 The present study describes the development of a comprehensive online two-dimensional liquid chromatography (2D-LC) approach to characterize hyaluronic acid and its acrylate derivatives (DS ranging from 0.4 to 3.1) in terms of molar mass and degree of substitution. In the first dimension of the 2D-LC method, separation according to chemical composition/DS was achieved by using a stepwise solvent gradient and a reversed phase C8 column. Fractions from the first dimension were automatically transferred to the second dimension comprising size exclusion chromatographic separation of the fractions according to molar mass. It was found that the hyaluronic acid derivatives were broadly distributed with regard to both chemical composition and molar mass. Fractions with different degrees of substitution were identified, and their molar mass distributions were determined. The study proved that comprehensive 2D-LC is a powerful approach to reveal the complex nature of hyaluronic acid and its derivatives. The online version of this article ( https://doi.org/10.1007/s00216-019-01799-x) contains supplementary material, which is available to authorized users. The preparation of the HA and HAM samples by L’Oréal Laboratories is acknowledged. The authors received financial support from the L’Oréal Research and Innovation (Aulnay-sous-Bois, France). ZV received funding for her MSc project from the NRF. There was no research involving human participants and/or animals. The work has been submitted with the consent of all authors. Botha C, Kuntz J-F, Moire C, Farcet C, Pfukwa H, Pasch H. Molar mass analysis of hydrophobically modified hyaluronic acid by SEC-MALLS: facing the challenges of amphiphilic biomacromolecules. Macromol Chem Phys 2018; https://doi.org/10.1002/macp.201800233.